I still fondly recall the synthesizer I had as a kid. With very little musical talent, I could still produce the most entertaining audio pieces. At least, entertaining to me! I used to spend hours creating what sounded to me like little tunes. Enhanced with built-in rhythms and tones they were, literally, music to my ears! I can only imagine what more talented children can do with this wondrous instrument. It provides such a wonderful introduction to the world of music, making it into child’s play, for real. The only “problem” with this is competition from siblings and even parents – everyone will want to have a go at playing Mozart. If you’re looking for a fun educational gift for a kid of any age, the Casio SA-76, the most popular mini synthesizer on Amazon, is now available at a 30% discount. And as always, you can easily sign up for their free s&s program. It’s very popular for a reason. Well, many reasons, actually. 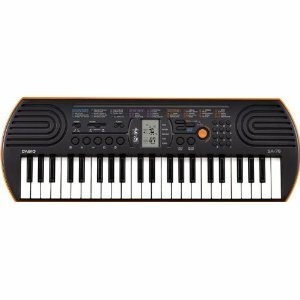 Starting with a 100 tones, 50 rhythms and 10 integrated songs provide variety and all with Casio’s seal of quality. Check it out here.